This post is part 5 of the Web API and OData V4 series. This article shows how Web API 2.2 with OData V4 can be used together with Unity as an IoC, Entity Framework with SQLite for persistence and also creates an OData service which can do CRUD operations. OData Model Aliasing features are used to map the entities in the controller. 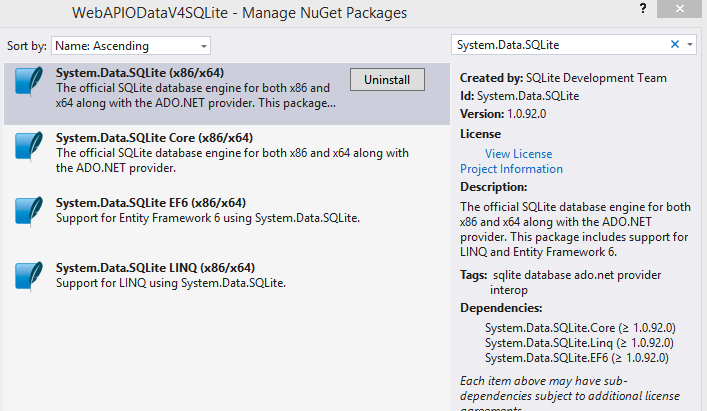 This package also installs Entity Framework. Add the animals.sqlite database to the App_Data folder. The application now requires an entity context. This context turns off the migrations features. Now Entity frameowrk is ready to be used with SQLite. Remove the Web API global register from the Application_Start method in the Global.asax file. Add a new class WebApiUnityActionFilterProvider. This class is used, if the attributes required DI. Change the WebApiConfig class. Replace it with the code underneath. 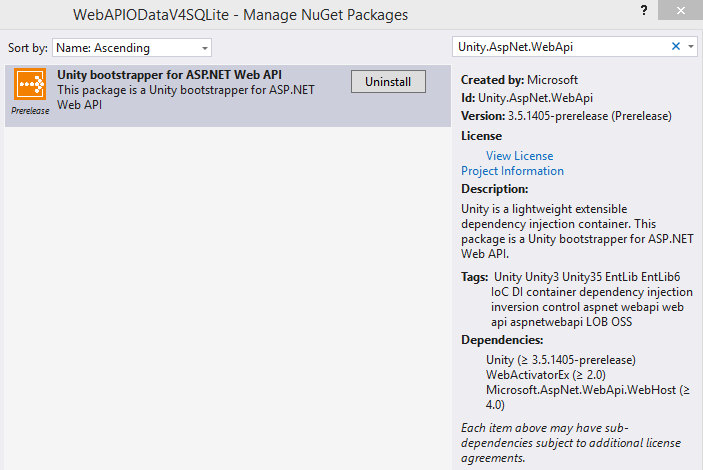 Now Unity is used for the Web API service. The Register method needs to be added to OWIN. Create a new OWIN startup class. This class starts the Web API OWIN middleware. Now the required classes can be registered with Unity. The OData model has already been defined and created in the WebApiConfig.Register method. The GetModel is where the model is created for OData. Now a simple controller can be created which implements CRUD for OData. The Entity context is added in the constructor using Unity. 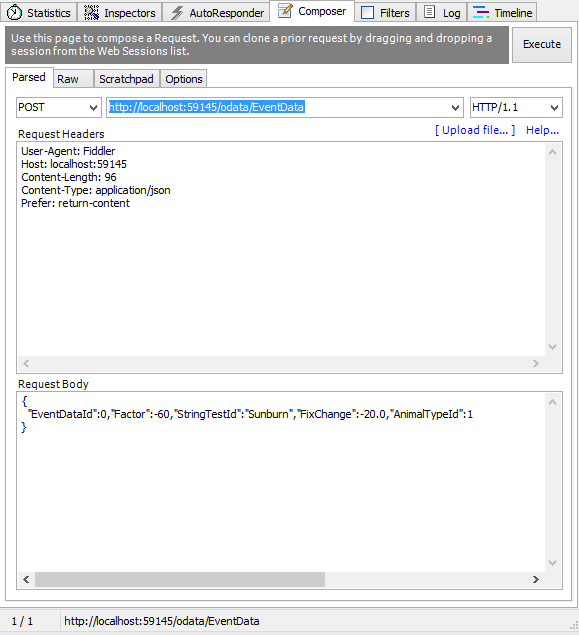 The Controller can then be tested using Fiddler or your browser for Http GET. It is important to use Prefer: return-content in the header, if you want to recieve responses as you expect, otherwise no-contents will be returned. You can see that the EventDataValues collection is mapped to EventData. Without this attribute, the get in AnimalType controller would be mapped to EventDataValues and also the route. By using OData Model Aliasing, the entites $ref and the routes can be controlled/defined or changed.